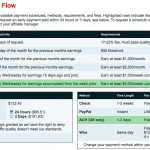 One of the most common questions I receive as an affiliate manager is about payment methods and schedules. I totally get it! Knowing how and when you’re going to get paid is important. 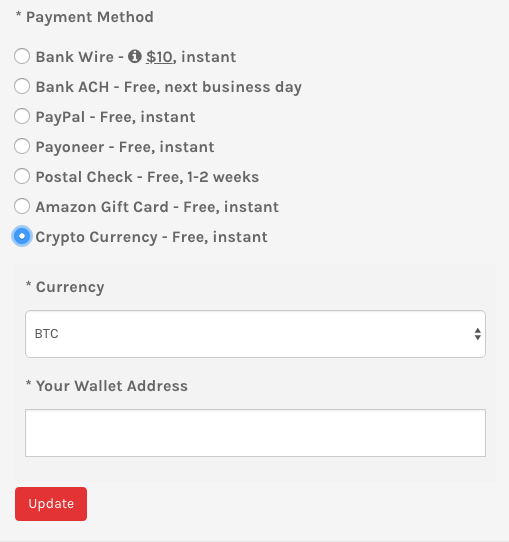 In this post, we’ll go over PeerFly’s payment schedules and seven supported payment methods. We pay publishers on a NET30 schedule with a $50 threshold by default. That means, for example, if you met your $50 threshold in September, all of your earnings up to September 30th would go out on October 31st. Occasionally, the last day of the month falls on a Sunday or a holiday so it may take a few days to process. Don’t fret, payments will start going out the next business day. We do offer alternate payment schedules on a per-offer basis. Offers’ quickest schedule is noted in the blue box on the offer page. After you’ve received your first NET30, you can request a faster schedule by clicking “Apply” and our compliance team will review it. If there’s a certain schedule you’re after you can actually search for offers that support it using the Advanced Search settings on the search offers page. We have a blog post that goes over some of our advanced search setting features here. Need your earnings between scheduled payments to reinvest into your campaigns? We allow publishers to request early payment for as low as a 5% fee in as few as one business day! The fee will vary by how quickly you request payment in and will be noted on the Cash Flow page before you decide to proceed. 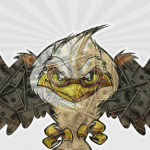 Get Cash Flow from PeerFly! Please note that we typically require at least one NET30 payment before we can approve a Cash Flow payment. We know that one payment method doesn’t fit all so we offer seven payment options to make sure all of our publishers get their earnings as quickly and easily as possible. Payoneer is popular with many publishers because it offers several different redemption options as well as supporting many smaller countries that PayPal doesn’t service. 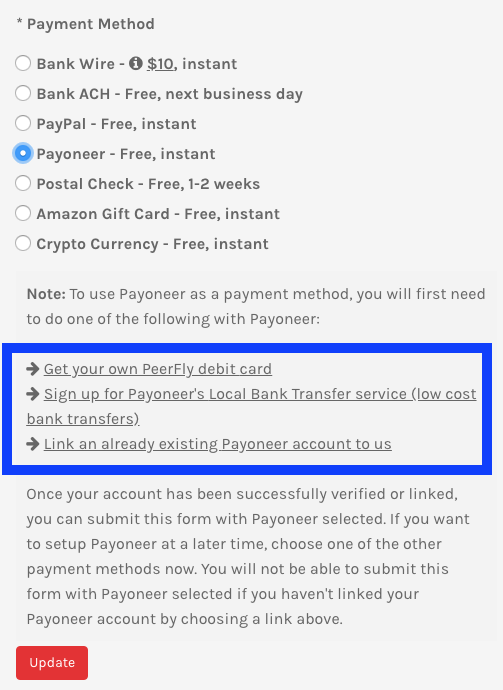 To integrate with Payoneer, we just need you to add PeerFly as a funding source through your dashboard. We need your first and last name on PeerFly to exactly match what you used on Payoneer. For example, Robert Jones and Rob Jones would not register as the same person even though it’s pretty clear they’re both you. If you need your name changed, just let your AM know and he or she will be happy to assist you. We’re huge fans of PayPal. It’s fast, reliable and usually free – what’s not to love? Integrating with PayPal is usually pretty easy, we just need you to add your PayPal email address to PeerFly. There are two main reasons we wouldn’t be able to add your PayPal account, name mismatch and account verification status. 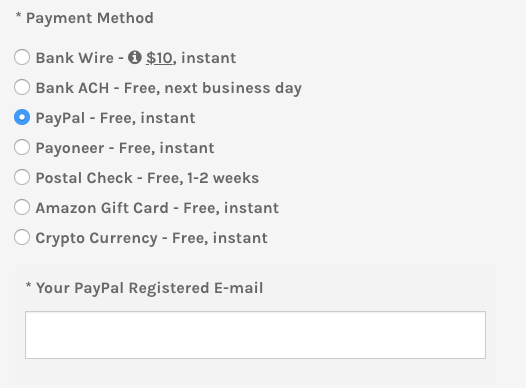 Similar to Payoneer, we need your first and last name on PayPal to exactly match how your name appears on PeerFly. Like we mentioned in our last example, PayPal wouldn’t think the names Robert Jones and Robert B. Jones match even though it’s pretty clear those are the same person. If you need your name changed, just let us know. If your name matches and you still can’t add your PayPal, it’s probably because your account isn’t fully verified. Not sure what the issue is? No worries, just screen shot these two pages and email them to your AM. Due to the anonymous nature of cryptocurrency, updating your payment method to cryptocurrency requires a few additional steps that other methods do not. This is just to ensure that it’s really you we’re paying! First, select the cryptocurrency you would like to be paid in. We support Bitcoin, Litecoin and Ethereum. Once you’ve added your wallet address and click update, you will receive an email from our system asking you to confirm the change. Make sure you click the link in that email or we will not be able to update your payment method. If you need to change your wallet address later, your affiliate manager will ask you to provide a photo ID to verify your identity. I am out of Budget and I need some money urgently. 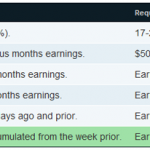 is it possible for me to get paid weekly? or at this next week? One area I think peerfly needs to improve on is the payment schedules. I am most times attracted to other companies whose default payment is weekly. None the less, peerfly rocks. Please sir I need a change of name so that I can match my PayPal. I first name on PayPal displays as my last name on peerfly. How can I change it? Please contact your affiliate manager directly and they’ll be able to help you update your name.